Here’s one of those stronger London X Ales that I’ve been telling you about. From Courage’s Horselydown brewery right next to Tower Bridge. Though, in a couple of ways, it’s not totally typical of Mild Ales from the capital. The OG is the same as Milds from rival London breweries, but there are some differences in the grist. For a start, there’s some black malt included, presumably for colour rather than flavour. Crystal malt was becoming quite common in Mild by this point, so that’s not odd. It’s what’s missing that struck me: no flaked maize. I’ve no idea what the sugar was, but No.3 invert seems a reasonable guess. 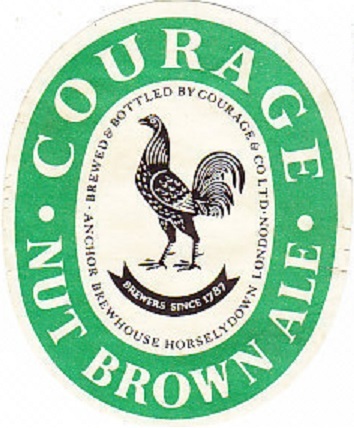 Especially as I know for certain that Courage were using it in their X Ale a couple of years later. Amusingly, given that this beer was brewed in October, a couple of months after the outbreak of war, it contains some German hops. Though they must have bought them some time before as they were from the 1912 crop. They had been in a cold store so shouldn’t have deteriorated much. As usual, all I know about the other hops is that they were English. I’ve gone for Fuggles as they usually reserved Goldings for classier beers like Pale Ale. This is what I would call a transitional Mild, with regard to colour. It’s not full out dark, but dark enough to be distinguished from Bitter. It’s fascinating to see how Mild gradually changed colour. Especially as it didn’t happen everywhere at the same time. London seems to have lead the way. Fantastic recipe. I brewed this a few months ago, and it is one of the best beers I have every made. Making my own invert #3 was not that hard. The only deviation from the posted recipe was to use Wyeast 1469 instead of 1099.